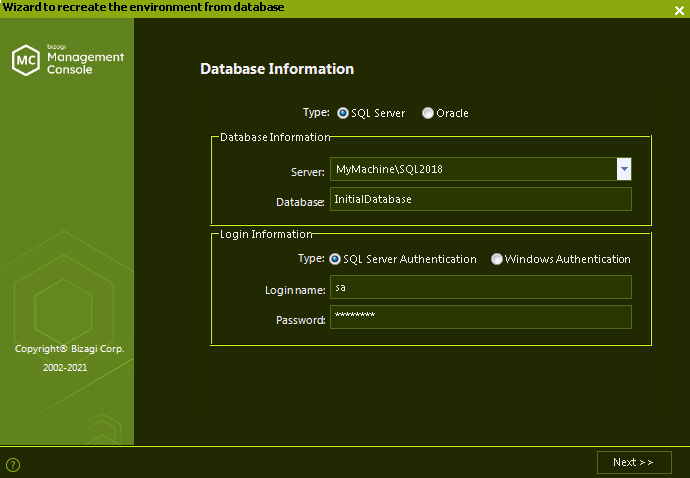 This option lets you to recreate a Bizagi production environment from an existing database. Through it, Bizagi will automatically create your project's Work Portal and Scheduler on an underlying .NET platform (with an IIS web application). This is a useful option especially when the Bizagi server in which your project was set up, has suffered any damage due to an external reason (i.e useful in a business continuity plan), as you can use a running database service of your project (or a stored backup of it), to restore your Bizagi system to a previous state. Using this option does not automatically activate an existing license. Therefore, have the license at hand, and contact Bizagi support if you require any additional help. If you do not have a database service of your project up and running, but have a full database backup, you first need to restore that backup in the database server. The procedure described below starts from having your project's database up and running, so that a new Bizagi server can connect to it. Install Automation Server in the machine which will be the new Bizagi server. The server requires access to the database server (where has the database to recreate from). Install Automation Server with the Bizagi version that matches the version on which your Production environment is running. Open the Management Console in the recently installed machine. 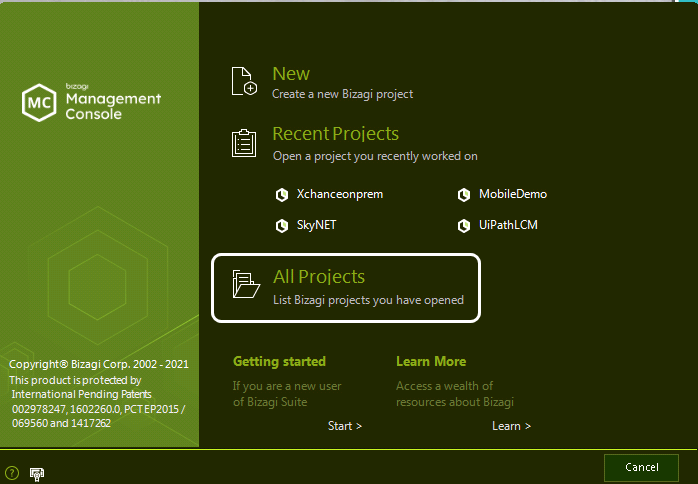 In the Welcome to Bizagi window, select the All Projects option. Bizagi will launch a wizard for this procedure. In the wizard window, enter the connection details to your Production database. 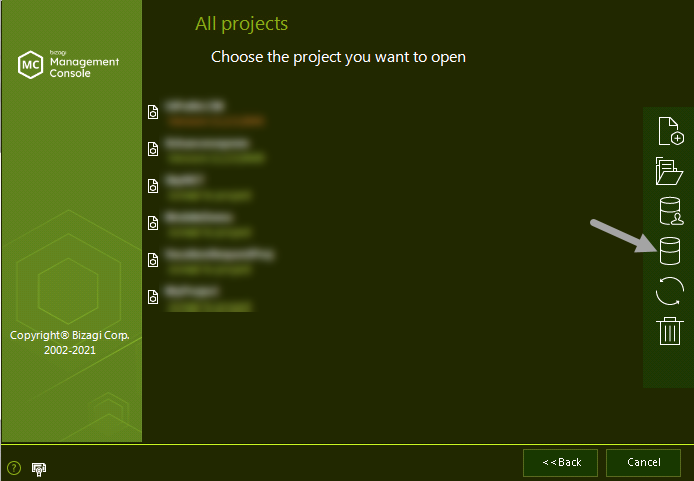 In this window, enter the following information (as you would when creating a new project). •Service: Access to your Oracle instance, specified as "databaseServer:port/serviceName". 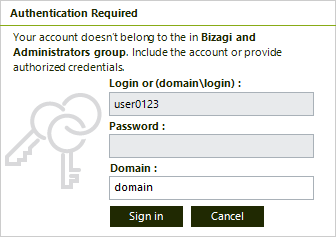 •Password: Password for the BizagiAdmon user. •User name: The name of the existing Bizagi user schema. •Password: Password for the specified user name. •Confirm Password: The same password specified above. Click Next to start recreating the environment. Bizagi will prompt for confirmation. Bizagi automatically creates the Work Portal and Scheduler service (as when creating a local new project). Remember that to perform such tasks, you must launch this option with an authorized account which is a member of the Administrators group for the server. A message will appear when the operation has been completed. Click Finish to close it. At this point, your new Bizagi server is set up and connected to that database.